Coached by Harry Kinert, who had taken the Freeport High School team to the state championship in 1951, the 1955-56 Oak Park-River Forest High School basketball team gained a reputation for overcoming adversity. An undersized team plagued with injuries throughout the year they finished the regular season with a mediocre record of 8-6 and a fourth place finish in the Suburban League. But the team caught fire in the post-season tournament, using speed and accurate shooting to play their way past much taller teams to reach the Sweet Sixteen round. They surprised Bloom Township-- a highly rated team lead by Jerry Colangelo who would go on to captain the University of Illinois, own the Phoenix Suns of the NBA, and earn a place in the Basketball Hall of Fame— in the Super Sectionals by a score of 62 to 57 to gain a place in the Elite Eight and a trip to Champaign. In the first game at Champaign OPRF shocked perennial basketball powerhouse Peoria Central 63-48, despite giving up an average 5 inches per man height differential. The Cinderella story ended when OPRF faced Edwardsville in the final four. The Edwardsville team, lead by Manny Jackson and Governor Vaughn who would both go on to star at the University of Illinois and play professionally for the Harlem Globetrotters, overpowered OPRF by a final score of 77 to 61. Once again hindered by injuries sustained in the games against Peoria and Edwardsville, OPRF lost to Dunbar in the consolation game 73 to 56 and finishing fourth in the state. 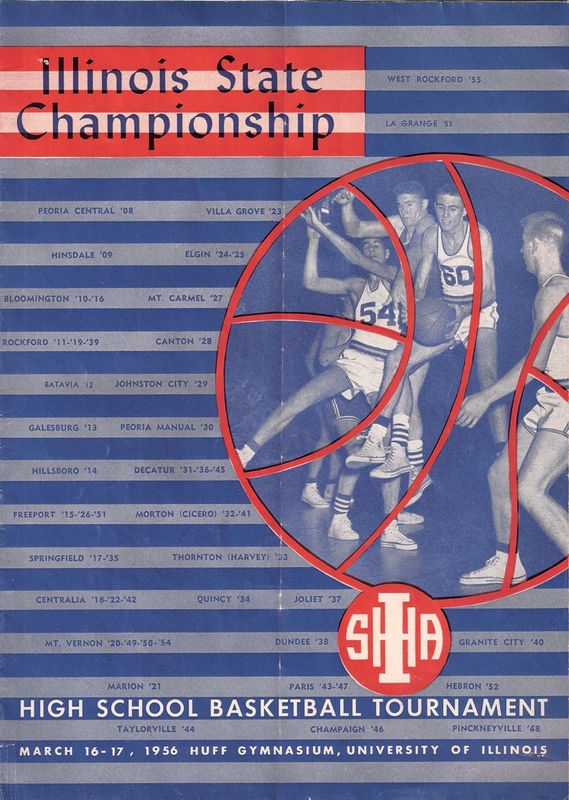 The Historical Society of Oak Park and River Forest is fortunate to have in its collection an Elite Eight pennant and a scrapbook of the tournament compiled by an OPRFHS student in 1956, as well as a commemorative silver platter given to Coach Kinert by the team. Tom Holmes, a center on the 1956 team, is a long-time volunteer here at the Historical Society.